I don’t remember when I first heard about Andy Warhol, but I remember knowing who he was when I was a kid. It wasn’t until I was in high school that I really started paying attention to him. He was such an eccentric character, I found him fascinating. Later, when I was much older I started questioning his art. Was it really art? All he did was recreate portraits and logos with fancy colors or techniques. He grew up in Pittsburgh, PA and moved to New York City in the late 1940’s. He had a very successful career as an illustrator in the 1950’s. You may have heard of a famous New York eatery called Serendipity 3. They are famous for their frozen hot chocolate dessert, but during this time period in Warhol’s life he would exhibit his work there. In 1962, Warhol became famous when he unveiled his Campbell’s Soup Can series. He then went on to do movie star portraits including Elizabeth Taylor, Marilyn Monroe and Elvis Presley. He also started The Factory, his studio space in New York, in which he worked with emerging talent, his Superstar performers, creating hundreds of improvised films. “Factory Girl,” a 2007 film about Edie Sedgwick, a socialite and Warhol’s muse, is a good look into this time period in Warhol’s life. Though the film is about Sedgwick, Warhol was a big part of her life and he is a predominant character in the film. His career grew steadily into the 1980’s where he collaborated with young artists Jean-Michel Basquiat and Keith Haring. He was a fixture on the New York club scene, partying at Studio 54 with Halston, Bianca Jagger and Liza Minnelli. And he was well-known in gossip columns across the country until his death in 1987 from complications from gall bladder surgery. 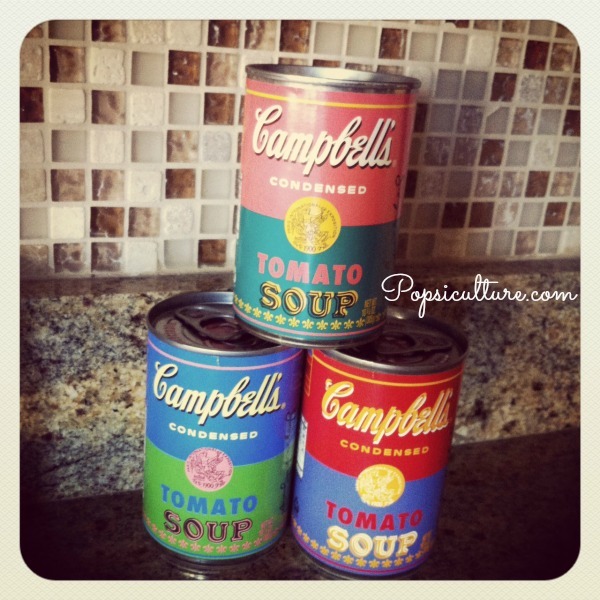 Campbell’s recently released a limited edition series of Tomato Soup cans celebrating the 50th anniversary of Warhol’s “32 Campbell’s Soup Cans” series. I was able to pick 3 of them up at Target. Now the question becomes, do we eat the soup or display the cans? The reality is art, as beauty, is in the eye of the beholder. What one considers art, someone else may question. But, what’s important is that Warhol followed the beat of his own drum. And now we get to celebrate his work with the art of soup. I’m glad you got them! I forgot about it and saw an end cap at Target full of them. Shawn went back yesterday and they were almost all gone. I think I’ll display ours, too.